These two automated testing buoys are part of a suite of advanced monitoring initiatives undertaken by LEA to better understand lakes and the factors that affect water quality in real time. Following ice-out in the spring, these buoys are deployed on Highland Lake and Long Lake and continuously monitor oxygen and temperature concentrations throughout the water column. They also measure chlorophyll, which indicates how much algae is present in the water and the Highland Buoy has light sensors in and above the water to measure clarity. On top of the Highland buoy is a weather station that monitors wind, temperature, precipitation and barometric pressure. The data is stored on internal computers and sent back to LEA every 15 minutes through cellular signals. Both buoys are powered by 3, 10-watt solar panels and a rechargeable battery. The data from the buoys are also coupled with another weather station LEA operates on Highland Ridge. 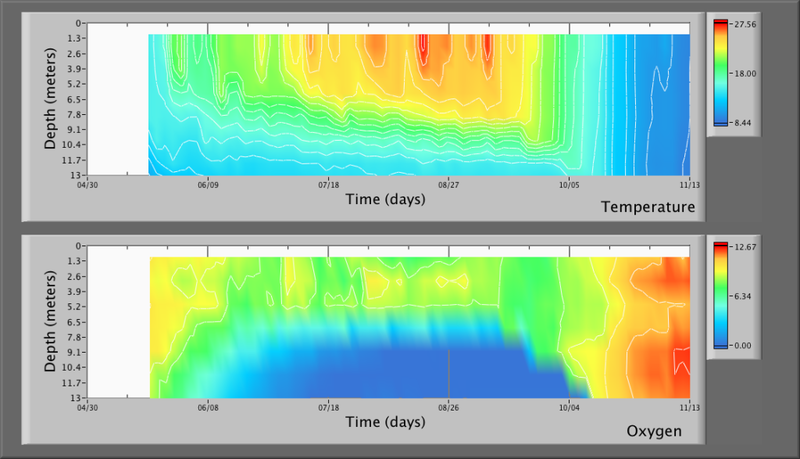 The top image shows the temperature structure of Highland Lake from April-November. The vertical axis is depth and the horizontal axis is time. The blue color from the top to the bottom indicates the lake mixed in October. The lower image shows oxygen levels over the same time period. The dark blue on the bottom shows the level and extent of time that anoxia occurred (no oxygen). This information allows us to map out oxygen and temperature concentrations throughout the growing season which is important in understanding the factors that control algae growth as well as internal lake structure and mixing. Tying the data to weather conditions lets us see the effects of wind, precipitation and storm events in real time – thus allowing for a better understanding and explanation of conditions in the lake. The top image shows the temperature at different depth from April-November. 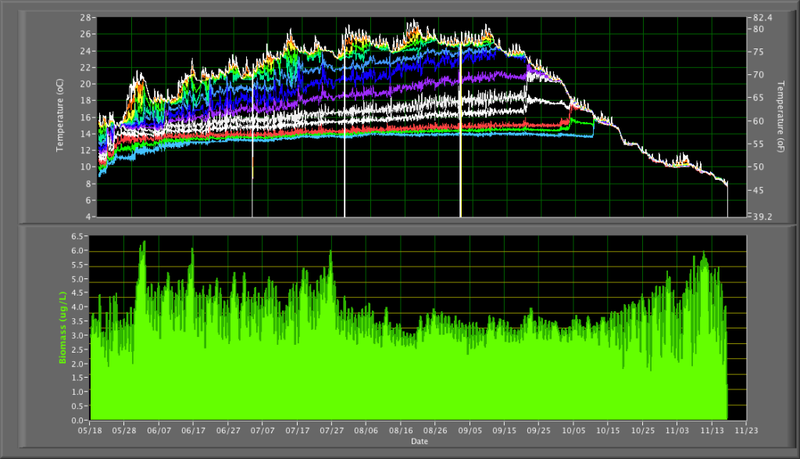 When the lines come together as they do on the right hand side, this indicates the lake is totally mixed. The bottom graph shows relative algae abundance over the course of the same time period. How did we get them? The Highland buoy was funded by a grant from an anonymous foundation and contributions from landowners around Highland Lake. The Long Lake buoy was funded by a very generous donation from a resident of Long Lake, foundation funding and contributions from lakefront landowners. Both buoys are part of GLEON (Global Lake Ecological Observatory Network), which is an international group of scientists and researchers who are using advanced technology to study lake systems. In design, setup, and operation, LEA worked closely with Colby College professor Whitney King and Fondriest Environmental. As technology continues to advance and prices come down, LEA will be using more automated monitoring equipment to better understand our lakes and thus better protect them. Within the next few years, LEA will continue to enhance these buoys and add other advanced equipment within surrounding watersheds.